A worldwide movement to adopt a new Perpetual Calendar to replace the 400-year old Gregorian Calendar with the Benedictine Perpetual Calendar comprising identical quarters and identical years, where each day of the year falls on the same day of the week every year. The Julian Calendar, which predates the current Gregorian Calendar by more than 1600 years, was adopted by Julius Caesar on 1 January 46 BC. It replaced the earlier and less accurate Roman Calendar. For the first time in world history, in an attempt to align the calendar with the true solar year, one day was added to the Julian Calendar in the month of February every 4 years. But the Julian Calendar year of 365¼ days was marginally longer than the true solar year and over time, the calendar became significantly out of step with the true solar year. The Pope, as Head of the Roman Catholic Church, had responsibility for approving the Christian calendar of the modern era. In the 16th century, Pope Gregory XIII (1502-1585) decided to resolve the problem of the "out-of-kilter" calendar once and for all. 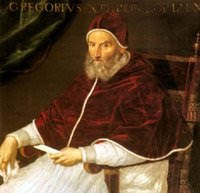 Pope Gregory XIII engaged several highly-regarded astronomers including the noted Jesuit Christopher Clavius (1538-1612) to devise a new calendar to overcome the deficiencies of the Julian Calendar. On 24 February 1582, he signed a Papal bull known as Inter gravissimas authorising the new Gregorian Calendar. On 1 March 1582, the text of this historic document was displayed at the doors of St Peter's in Rome and was promulgated throughout the Church and the rest of the world. The new Gregorian Calendar was proclaimed to come into effect in October 1582. At the last moment of Thursday 4 October 1582, the calendar jumped forward to Friday 15 October 1582 with the world "losing" 10 days forever. This adjustment corrected sixteen centuries of progressively inaccurate time keeping. Pope Gregory XIII also introduced a major reform to the leap year rule. Instead of routinely adding a day at the end of February every 4 years, leap years would NOT occur in centesimal years, such as 1700, 1800, 1900 unless those years were divisible by 400. Under this new arrangement, 2000 and 2400 would be leap years but 2100, 2200 and 2300 would not qualify as leap years. This ensured that the Gregorian Calendar and the true solar year remained virtually identical, with the Gregorian Calendar moving ahead of the true solar year by 25.96 seconds a year or only 1 day every 3327 years. Not all countries adopted the Gregorian Calendar immediately. It took until 1752 for the Gregorian Calendar to be adopted by England and the American colonies. Sweden followed a year later. Germany did not change completely until 1775. A congress of eastern Orthodox churches finally agreed to the Gregorian Calendar in 1923 and on 1 October 1949, the new Chinese ruler Mao Zedong (1893-1976) announced that China would forthwith adopt the Gregorian Calendar. It therefore took 367 years after the commencement of the modern calendar for it to be agreed to by the whole world. The Gregorian Calendar has had its limitations for over 400 years. Every year, a new calendar is required because days of the week change annually over the 28-year cycle of the current calendar. Every year, festive seasons, public holidays and school holidays are held at variable times to coincide with the ever-changing calendar. Other celebrations such as holy days - including Christmas Day - are held on different days of the week from one year to the next. The problem arises because each year of the current Gregorian Calendar comprises 52 weeks and one day (365 days), or 52 weeks and 2 days in a leap year (366 days). The extra day forces the entire calendar to change by one day in the following year, or by 2 days in the year following a leap year. What an enormous benefit there would be for the whole world if an unchanging, perpetual calendar could be adopted which would fix all days, weeks and months in such a way that they would NEVER change. New Year's Day would always be on a Sunday, Christmas Day would always be on a Monday and all other dates and anniversaries would be fixed in perpetuity. Persons married on a Saturday would celebrate their anniversary on a Saturday for the rest of their lives. The United States Presidential election would always be held on Tuesday, 7 November every 4 years. This would still comply with the U.S. Constitutional requirement for it to be held on the Tuesday following the first Monday in November. Tuesday, 7 November would also be the fixed date for holding the Melbourne Cup in Australia every year - the greatest horse race in the southern hemisphere. Churches, schools, universities, employers, workers, commerce, industry and every other form of human endeavour throughout the world could confidently plan ahead many years in advance, with the certainty of an absolutely fixed calendar. People would have to buy only one calendar - which would last a lifetime! On 21 October 1930, Elisabeth Achelis (1880-1973) founded a movement in the United States to promote a new world calendar. The proposal was considered by the United Nations after World War II but the idea was officially torpedoed by the United States on 21 March 1955 in a memorandum forwarded to the Secretary-General of the United Nations. The Benedictine Perpetual Calendar© - which is reproduced below - is now being promoted by Councillor Paul Tully of Ipswich, Australia in his capacity as Convenor, BENEDICTINE PERPETUAL CALENDAR MOVEMENT. His proposed calendar retains the key essential features of the current Gregorian Calendar. 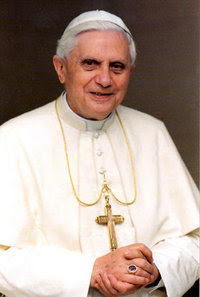 As with the naming convention for the Gregorian Calendar, the Benedictine Perpetual Calendar is named after the current Pontiff Pope Benedict XVI (1927- ) who has the power and authority to oversee its introduction. You may email the Association at Benedictine Perpetual Calendar Movement. A letter was sent to Pope Benedict XVI on 30 December 2005 requesting him to give consideration to the introduction of the Benedictine Perpetual Calendar with effect from 1 January 2012. A copy of the letter is reproduced below. The Benedictine Perpetual Calendar© has 12 months based on 4 identical quarters comprising 31, 30 and 30 days with each quarter commencing on a Sunday. Therefore, each quarter has 91 days with the total number of days in the 4 quarters being 364. There would be an extra day - a public holiday to be known officially as New Year's Eve - between Saturday 30 December and Sunday 1 January. This would bring the total number of days in each Benedictine Calendar year to 365, which is the same as the standard non-leap year in the current Gregorian Calendar. New Year's Eve would always fall over a weekend and would always be a public holiday. A Leap Year would still occur every 4 years and the extra day would fall between Saturday June 30 and Sunday 1 July in the Benedictine Perpetual Calendar©. It would also be a public holiday. New Year's Eve and the quadrennial Leap Year Day would not be allocated to a specific day of the week but would be designated for official and all other legal purposes as 31 December and 31 June respectively. To ensure an orderly transition from the current Gregorian Calendar, the Benedictine Perpetual Calendar© should begin on 1 January in a Gregorian Calendar year which commences on a Sunday. During the next 3 decades, the years 2012, 2017, 2023, 2034 will all qualify as possible commencing years for the Benedictine Perpetual Calendar. Pope Benedict XVI, who is the 265th head of the Roman Catholic Church, now has an opportunity to adopt the Benedictine Perpetual Calendar© - the first review of our modern day calendar in more than 400 years since Pope Gregory XIII authorised the current Gregorian Calendar. Pope Benedict XVI, who is an accomplished scholar of theology, could go down in world history as the reformer of the modern calendar - the spiritual leader who brought common sense to the current calendar of confusion. As in 1582, the authority of the Pope is all that is needed to make the Benedictine Perpetual Calendar© a reality. THIS WEBSITE IS DEDICATED TO THE ADOPTION OF THE BENEDICTINE PERPETUAL CALENDAR© THROUGHOUT ALL NATIONS FROM SUNDAY, 1 JANUARY 2012.
to register your support for the new calendar. I am writing in my capacity as Convenor of the newly-formed Benedictine Perpetual Calendar Movement to seek your earnest consideration of a new perpetual calendar which is intended to replace the Gregorian Calendar approved by your predecessor Pope Gregory XIII, 423 years ago in 1582. The dream of a new calendar was first espoused by Ms Elisabeth ACHELIS in New York in 1930 who spent most of her adult life promoting a new fixed calendar. It was even considered by the United Nations and, I understand, had support from the Vatican. However, the proposal for a new calendar has not been seriously considered since 1955. The Benedictine Perpetual Calendar is intended to replace the current calendar of 365 days or 52 weeks and 1 day. It is this extra day which forces every date on the calendar to be adjusted forward by one day in the following year, or 2 days in the year following a leap year. The current Gregorian calendar is based on a 28-year cycle which is confusing, costly and inappropriate for the modern world. The proposed Benedictine Perpetual Calendar - a copy of which is enclosed - is as simple as it would be beneficial to the people of the world. As with the Gregorian Calendar of 1582, its name honours the Pontiff who can make it a reality. A copy of the relevant internet website material seeking this reform of the current Gregorian calendar is also enclosed. As the name implies, the Benedictine Perpetual Calendar would be fixed in perpetuity, with each date falling on the same day every year. This is achieved by officially recognising New Year's Eve as the day after the last day in December. It would not be assigned to a particular day of the week, thus fixing all of the other 364 days for all time. In leap years, an extra day would be similarly added at the end of June. Each quarter and each year of the Benedictine Perpetual Calendar would be identical. New Year's Day would always be on a Sunday and Christmas Day would always be on a Monday. Churches, schools, universities, employers, workers, commerce and industry could confidently plan ahead many years in advance, with the certainty of an absolutely fixed calendar. To ensure an orderly transition from the Gregorian Calendar, the Benedictine Perpetual Calendar (which commences on a Sunday) should come into effect in a Gregorian Calendar Year which also commences on a Sunday. During the next 3 decades, the years 2012, 2017, 2023 and 2034 will all qualify as possible commencing years for the Benedictine Perpetual Calendar. In your revered position as the 265th head of the Roman Catholic Church, I am asking you to review the current calendar for the first time in more than 400 years. I trust that you will realise the simplicity of the proposal and the enormous benefits which would flow worldwide from its timely introduction and that favourable consideration will be given to the proposed new calendar with a view to its universal introduction on 1 January 2012.